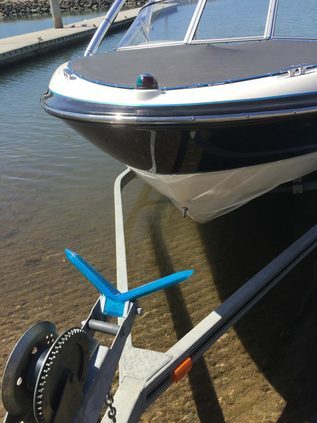 BIGVEE™ has a huge 375mm wide Vee shaped catch area, so when you drive on, even if you are off centre then the Vee shape will catch your boat and guide you back into the centre. All professional fisherman “drive on”. They understand the risks and difficulties of attempting to manually move a boat onto a trailer against the wind and tide. They also have no interest in the physical effort winching a boat up a trailer involves. Plus driving on is a huge time saver. BIGVEE™ replaces the narrow bow stops that have been in existence for the last 80 years. Those old bow stoppers were designed to provide a soft surface for your boat to sit against once your boat is winched forward into place. Unlike BIGVEE™ most of them offer no or very little guiding ability. BIGVEE™ is “One size fits all”. Every BIGVEE™ comes in kit form and can be easily fitted at home or by your favourite boating shop. BIGVEE™ replaces existing bow stops with a mounting width from 75mm and up to 120mm (3 inch up to 4`3/4 inch). The metal shims provided with every BIGVEE™ kit allow it to adapt easily within this broad size range. BIGVEE™ is used if you have a centre bolt sized M12 or M16 (1/2 inch or 5/8 inch) If you have the larger M16 bolt size you will use our high tensile strength M12 bolt along with the simple spacer rings we provide to achieve as much strength as you had with your M16 bolt. If your trailer uses a bolt smaller than M12 you can still use the BIGVEE™ by drilling your trailer up to 12mm.